Over 1600 pupils from schools across Northern Ireland attended a series of science shows hosted by the University of Ulster at its Coleraine, Magee and Jordanstown campuses to celebrate ‘Engineers Week Ireland’. The science shows, which were part of a week long programme of events across the island of Ireland to celebrate the world of engineering, were completely booked out. The University of Ulster offered theshows as a collaborative venture between the Faculty of Computing and Engineering and the Department of Access and Educational Partnerships and funded through the University of Ulster’s Access Agreement. The one-hour long ‘Magical Science and Engineering Show’ delivered by Dr James aimed to raise the educational aspirations of Key Stage 2 and 3 pupils. Professor Millar, Dean of the Faculty of Computing and Engineering explained: “It is hoped that pupils will gain an understanding of the exciting challenges and amazing developments that engineers are involved with on a daily basis. 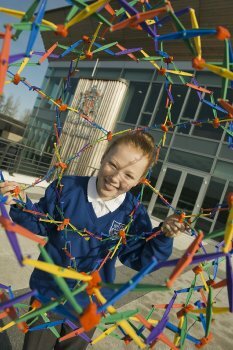 It is intended that by engaging with pupils from a young age it will encourage the development of curiosity about science and engineering. Professor Millar continued: “Employment opportunities are excellent for Ulster’s engineering graduates. Our engineering courses generally include a placement year in industry which means that Ulster graduates are ready for the workplace. Financially, starting salaries in engineering are amongst the best across all industry sectors." Demand for well-qualified skilled graduates continues to outstrip supply. Ulster offers core engineering courses such as electronic, mechanical, mechatronic and engineering management as well as niche courses in growth sectors such as biomedical engineering, clean technology, technology with design and sports technology. To support this growth in demand for well qualified engineers, the Faculty of Computing and Engineering will be extending engineering course provision for entry in 2013 to include MEng/ BEng Hons Renewable Energy Engineering and MEng/ BEng Hons Mechanical and Manufacturing Engineering at Magee campus,” he added.